Guiding, informing, and educating families in divorce. How Much Support Can I Get? Part Two of the discussion launched in last month’s newsletter addresses spousal support (formerly known as alimony). Unlike child support which has no tax consequence, spousal support is deductible for the payor and taxable as income to the payee. Contrary to child support which involves a cut-and-dried calculation, the calculation of spousal support is more complex and is addressed in California’s Family Code section 4320. The first consideration is the parties’ marital standard of living; where they shopped, ate out, vacationed, et cetera. Couples with a modest marital standard of living can expect modest support orders. The opposite might be true for couples who lived beyond their means. Using the marital standard of living as a starting point, some of the other factors that must be considered include the age of the parties, time out of the workforce, job skills, the job market for those skills, the cost of retraining to obtain more marketable skills, and the length of the marriage. Generally the courts expect an individual receiving support to become self-supporting within a period equal to half the length of the marriage. If a party fails to become self-supporting, the court can take that into consideration and modify support. The misunderstood significance of a marriage over 10 years, or a “marriage of long duration,” is not permanent support, but the court’s ongoing and permanent authority to revisit support issues. A young, capable individual who was married 12 years will likely be required to become self-supporting within six years and a failure to do so could jeopardize their receipt of support. On the other hand, an individual after retirement age who was married 8 years might receive support for the rest of their life if a court finds that is what’s fair. Couples going through divorce who utilize the Collaborative Law Process or Mediation can avoid the gamble and expense of paying for trial on the issues of support and can reach agreements far more flexible and creative than any court. And they can agree to terminate the court’s authority to make changes if they believe that would make for a better deal. At The Law Collaborative we have over fifty years of combined experience handling complex support issues. We design unique legal strategies based on the individual factors of your case. When necessary, we consult forensic financial experts to ensure the best outcome. We are committed to making sure your needs are met. Our next Second Saturday Divorce Workshop will take place on September 9 at our Woodland Hills Office. This workshop is beneficial to anyone contemplating divorce or curious about their options. The workshop is free, but a reservation is required. Please call our office at (818) 348-6700 to RSVP or visit www.thelawcollaborative.com/secondsaturday.htm for more information. The Second Saturday Divorce Workshop for Women is an excellent way for women who are contemplating divorce or who are in the process of divorce to take control of their lives, learn about their rights, and protect themselves in court. Speaking at the event will be attorney Robert Borsky, Certified Divorce Financial Analyst Irene Smith and licensed marriage and family therapist Rosalinda O’Neill. Robert Borsky has been practicing law since 1981. He limited his practice to Family Law from 1984 through 2001, taking occasional special cases referred by Judges. During this time, he spent four years on the exclusive Gang Intervention Task Force, representing juveniles. From 2001 to 2006, Robert also practiced insurance defense and Workers’ Compensation Law while maintaining his family law practice. Robert Borsky has served as a mediator, arbitrator and Judge pro tem for the Los Angeles Superior Court since 1986. He is a member of the Los Angeles, Beverly Hills, and San Fernando Valley Bar Associations. 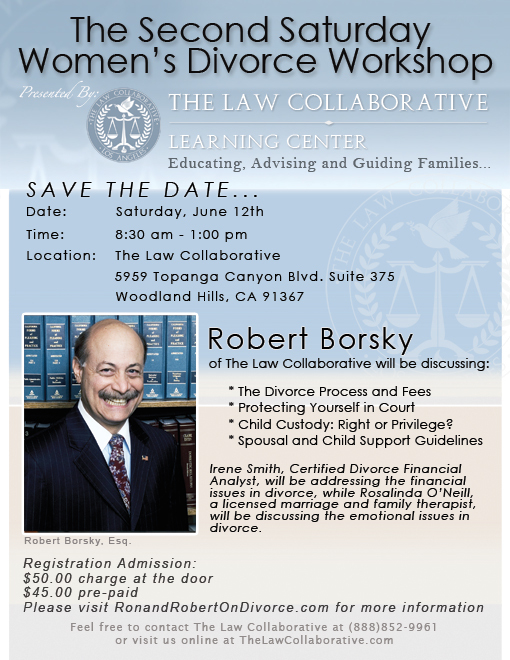 Robert served as President of the Long Beach Bar Association, Family Law Section, 1994-1995 session, and is a past Co-Chair of the California State Child Custody Committee. As an advisor to the Superior Court, he received the first ‘Judge William McFadden Award,’ for his contribution in assembling the first Master List of qualified Child Custody Evaluators, Protocols and Evaluator Retainers. Robert taught college level courses at USC Law School from 1990 to 1998, and has been a guest speaker at State Bar functions, and local County and City functions. Robert has spoken frequently on local radio stations, and has written numerous articles for the bench and bar. Click here to read more about Robert Borsky. Irene Smith holds the designations of Certified Divorce Financial Analyst™, Certified Financial Planner® and Certified Public Accountant. Irene obtained her Bachelor of Science degree in Accounting from California State University, Northridge and her MBA degree in Finance from the Wharton School at the University of Pennsylvania. Before starting her financial planning practice in 2001, Irene had an extensive corporate career and developed expertise in the fields of taxation, finance and real estate. After experiencing the impact divorces had on the lives of her family and friends, she decided to obtain additional training as a Certified Divorce Financial Analyst (CDFA) to help divorcing individuals make better informed financial decisions. As a CDFA, Irene analyzes the financial issues of a divorce and informs clients about the long-term effect of financial decisions made today. She can help clients avoid the common pitfalls of divorce by evaluating the tax implications of dividing property and the financial impact of various settlement options. Click here to read more about Irene Smith. Rosalinda O”Neill holds a bachelor’s degree in finance from the University of Miami and a master’s in counseling psychology from Loyola Marymount University in Los Angeles. She is a California Licensed Marriage Family Therapist with expertise in addiction, conflict resolution, partner dynamics, relationship, trauma and achieving success. Rosalinda has over 30 years of high level corporate experience. Rosalinda is President and founder of CEO LifeMentor®, Inc since 1984. She is a member of the Physicians’ Diversion Evaluation Committee of the Medical Board of California. Her non-profit leadership involvement includes Rotary International and Rotary Club of Beverly Hills, City of Hope Board of Governors and the American Heart Association, Ventura Division. Click here to read more about Rosalinda O’Neill. A Serious Girl Serious about family, serious about marriage, not so serious about everything else. Dr. Jim Walton Your source for mental health tips and an overall guide to wellbeing. Family Wizard Empower your shared custody and co-parent peacefully. Journey of Two Hearts Divorce counseling and therapy in Los Angeles. MCLE Credits Available The Law Collaborative is committed to providing professionals with training that will educate them in collaborative practice and protocol. The Pro Child Way Have you ever considered how your child’s spirit can be nurtured through divorce? This page took 0.276 seconds of computer labor to produce.